Carte Generale des Decouvertes de l'Amiral de Fonte et Autres Navigateurs Espagnols, Anglois et Russes pour la Recherche du Passage a la Mer du Sud. One of the most splendid combinations of hard fact and speculative fantasy to appear in the history of cartography. This map, prepared by Joseph-Nicholas de L'Isle 1762 and republished by Vaugondy in 1772, covers parts of Siberia and northeastern Asia as well as the northwestern parts of the American continent, including the Hudson Bay, and the legendary Northwest Passage. Traces the routes of several important explorers, most notably Tchirikow, Frondat, Bering and De Fonte. The origins of the wonderful map can be traced to a 1706 English publication entitled 'Memoirs of the Curious.' This short-lived magazine published a previously unpublished account by a Spanish Admiral named Bartholomew de Fonte. De Fonte is said to have sailed up the Pacific coast of North America in 1640. On this voyage he apparently discovered a series of gigantic lakes, seas, and rivers heading eastward from the Pacific towards Hudson Bay. The De Fonte story relates how, on one of these great inland lakes, he met with a westward bound ship from Boston that must to have come through the Northwest Passage. Today, based upon inaccuracies and falsities, we know the entire De Fonte article to have been a fabrication, however, it set 18th century afire with speculation that a Northwest Passage must indeed exist. When Joseph-Nicholas de L'Isle, younger brother of the better known Guilleme de L'Isle, returned from his tenure at Russian Tzar Peter the Great's 'Academy of Sciences' he decided to publish a compilation of secret cartographic data obtained from previously unknown Russian expeditions to Kamtschaka and the coast of Siberia. These seminal explorations included the discoveries of Tchirikow, Frondat, Bering, among others. He produced a ground breaking and largely accurate mapping of the peninsula of Kamchatka and the coast of northeast Asia. However, across the Pacific, the contrast with reality could not be more extreme. De L'Isle based the fantastical North American portion of this map entirely on the supposed journeys of De Fonte. 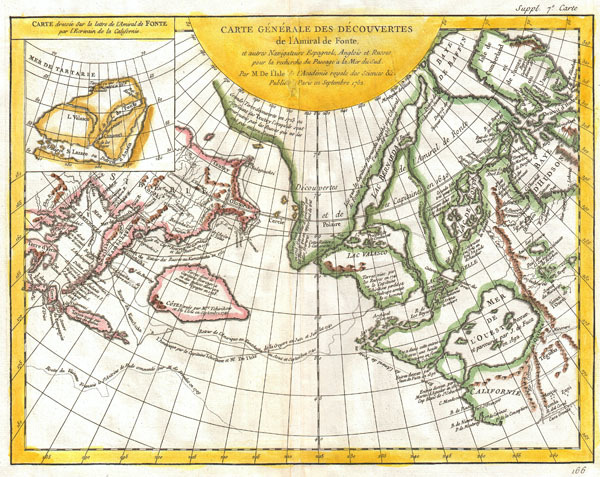 This map traces the course of De Fonte from Cape Medocino northward, past the mouth of the mythical 'Mer De L'Ouest' discovered by Juan de Fuca in 1692, around an unknown archipelago to access a series of lakes and rivers heading eastward to communicate with the Hudson Bay. It was on one of these great lakes, possibly the Lac Belle or the large Lac de Fonte, where De Fonte claims to have encountered a westward bound vessel heading from Boston. Heading north form this same archipelago, De L'Isle also describes De Fonte's Lac Valasco and Lake Bernarda, which run eastward towards Baffin Bay only to be blocked at their extreme eastern terminus. Dominating the northern part of the map is a great Arctic continent which blocks any further potential for a northwest passage to the north. The upper left quadrant of this map features an alternative take on De Fonte's Strait of Anian. Anian was first mentioned in the journals of Marco Polo and was first noted on maps by Bolognini Zaltieri in 1561. Later the term was popularized in a John Donne poem, 'Anyan if I go west by the North-West passage.' In the 18th century, it was interpreted as the Bering Strait by cartographers, successfully transitioning it from the realms of fiction to cartography. Anian presupposed the existence of a Northwest Passage and, as such, was entirely mythical, though the lands that are now Alaska long bore that name. This entire map is in sharp contrast to Jefferys' map of the same region. In an alternative to the De L'Isle map, Jefferys imagined a slightly more accurate picture of the extreme northeast with a series of large rivers running eastward towards Hudson Bay. These two disparate cartographic interpretations of the De Fonte story inspired considerable debate among European intellectual circles until the matter was finally put to rest by the expeditions of James Cook. Nonetheless, this is altogether fascinating map of the Northwest Passage and the American west and a must for any serious collection dedicated to this region. This map is part of the 10 map series prepared by Vaugondy for the Supplement to Diderot's Encyclopédie, of which this is plate 7. This seminal map series, exploring the mapping of North American and specifically the Northwest Passage was one of the first studies in comparative cartography. Supplement to Diderot's Encyclopédie, ou dictionnaire raisonné des sciences, des arts et des métiers. or Vaugondy's Recueil de 10 Cartes Traitant Particulierement de L'Amerique du Nord, (1779). Very good condition. Original centerfold. Wide clean margins. Original platemark visible. Blank on verso. Pedley, Mary Sponberg. Bel et Utile: The Work of the Robert de Vaugondy Family of Mapmakers. 454. Wagner, Henry R., The Cartography of the Northwest Coast of America to the Year 1800,, 637-7. Kershaw, Kenneth A., Early Printed Maps of Canada, 1232. Phillips, P.L. (Atlases) 1195.7.